As the registry powering the .design domain extension, it is humbling to see uses for .design that you never would have imagined. Not only are these .design sites more beautiful, creative, and user-friendly than your average website -- they are also very innovative. Recently, we see several major brands creating their own .design presence. One of the most recent sites we’ve discovered is webex.design from the Silicon-Valley powerhouse, Cisco. We recently met Cisco Webex’s Design Group at the Interaction19 conference, hosted by the Interaction Design Association (IxDA). Cisco was there with the main goal of identifying potential talent and recruiting new hires on to their team. They launched their website, www.webex.design, just before the start of this event with the goal of using it to inform and attract talent at the conference. We began corresponding with Cisco’s Danielle Epstein, and learned that webex.design is helping to showcase their design team and the work they do against challenging design problems related to teamwork and communication. Not only does this site provide them with tools like capturing job interest from the event’s attendees, but it also provides the public with insight into the products this team works on as well as their team culture, values, and structure. Over the next few months, The Design Group will begin using this site for internal purposes as well. The dream is to make webex.design the home for all design operations content so that designers can access all important information and resources from a single source as opposed to from a variety of tools. “What's really cool is that someone looking at our site from the outside will go to the same place as a new hire once they join. It's a continuous experience from pre-hired to hired and ramping up all the way to being a pro on the team”, Danielle notes. The work is already paying off, even though the site is still under development. The team is proud to have an official presence and they can't wait to see how the site will continue to evolve. Cisco is building this site so they can be seen as design leaders alongside some of their competitors and other successful companies, many of which have their own .design sites. The Design Group also cited many other .design sites, such as slack.design, airbnb.design, and uber.design, as further inspiration when building webex.design. Taco Tuesday? Why wait?! Finding tacobell.design today, Friday, is like divine intervention. Yes, yes, I will spend some time this afternoon looking at glossy Mexican food photos and dreaming of Miami. 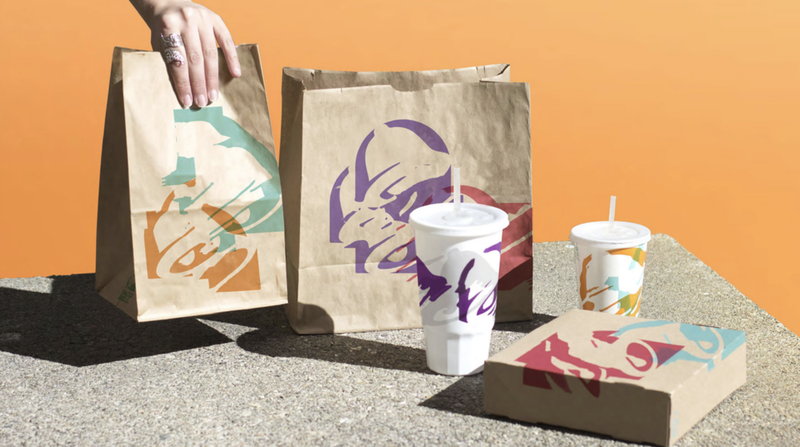 The new site, tacobell.design, is unabashedly fun. It makes me think of Miami because the bright, tropical color scheme on the “about” page is beyond captivating. 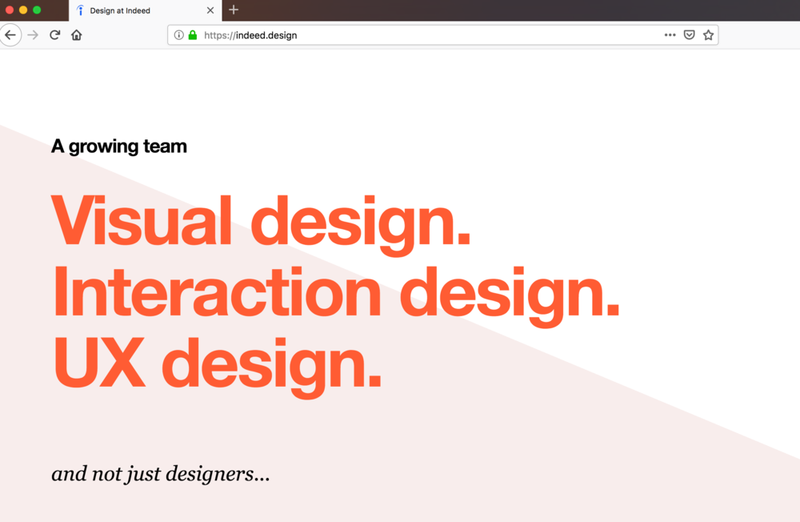 While there are now many brand names using .design sites to show off their design department, I can’t think of another example where I imagine the entire department working out of the corner booth surrounded by margaritas. They look fun, cool, and creative. Wait, do they serve margaritas at Taco Bell? The strategy beyond the site is probably supposed to be fun too! Don’t forget that this is a trail-blazing brand that is famous for its social presence and its marketing campaigns. It is also the only .design brand site that I can think of that calls out its Instagram presence in a major way (most other .design brands link to Twitter, which now that I think of it, isn’t a good match since Instagram is a far more creative, graphic, and engaging medium especially for the target audience, designers). The site looks simple at first glance, but clearly professional. Besides the amazing, personal photography of the design team members, the integrated Instagram feed shows off curated and casual shots alike, but even the latter are effortlessly stylized. Stop bad-mouthing millennials, they make this professional, creative branding look easy. However, digging beyond the three main pages of the site (“Work”, “Play”, “About”), we see that the Work page is actually very in depth. Each tile image opens up an entire case-study of the initiative. We can click to open up a break-down of the 2016 rebrand effort, individual marketing campaigns, their Instagram strategy, and more. It’s the type of thorough branding and studied, creative dedication that many aspiring designers dream of. I have to assume that this new venue allows them to enter the field of brands looking to compete for and recruit top design talent by showing off their work. Still, in a typically impressive way, Taco Bell manages to make it all look so fun and free-wheeling. They’ll let facebook.design and uber.design compete for the same talent and instead focus on finding the “weirdos and rebels,” as they call themselves. If there was any company that shouldn’t need help hiring, it would be Indeed, the operator of the popular job site indeed.com. They claim to be the #1 job site in the world, with 200M unique monthly visitors. We know from experience that they do a good job sending traffic and talent to open job postings. Still, even Indeed is competing for top-talent. As we’ve documented frequently on our blog, many of the top tech companies are all competing for the same designers. So even though Facebook, Uber, Amazon and Indeed may all have very different businesses, they are interested in the same possible applicants. All of them have content marketing and recruiting sites aimed at designers on their .design name, including indeed.design. So while the site may be sparse they have good reason. The site basically says, “we’re busy building. Come join us.” So they are effectively able to jump into the competition against sites like facebook.design, airbnb.design and others without dedicating the same amount of content resources. They know a hiring and recruiting trend when they see one and so Indeed jumped on at the right time and in their own way. We’re excited to see the public releases of what these new design teams are working on at Indeed. It is now no longer a trend but a standard practice to give a design department its own content destination, soapbox, and recruiting platform. Increasingly this is taking the form of a website on a .design domain. The introduction of the amazon.design site certainly marks a further maturation of the development we saw previously from the likes of facebook.design and airbnb.design. What currently sets the new amazon.design site apart is its reliance on videos and first person accounts from their designers. At launch, the site featured five videos, each focusing on a given designer. The videos feature both design team leaders and team members, who all seem to work in the broad field of interaction or user-experience design with additional focuses such as motion design and sound design. Each video also highlights how the Amazonian (yes, they call themselves that) was an interesting person before they arrived at Amazon and how they continue to focus on solo pursuits as well. The “work-life” balance is addressed head on. The designers in these videos spend as much time talking about what excites them in their personal life and pursuits as what inspires them at work. It’s clear that they are talking to potential peers and future colleagues, inviting fellow creatives to consider the benefits and challenges of working at Amazon. I’ve personally seen Amazon exhibit at multiple, major design conferences. Unlike other vendors, they were not hawking products or wares but the company itself; their presence at these events has largely been a recruiting push. Of course a company of Amazon’s stature spends considerable time and resources finding the right candidates, hiring, and retaining them. It is a logical but important step to provide a destination for design recruits to learn more about the design department from their potential peers and teammates rather than just the HR or recruiting team. The site links up to existing channels as well as personalized recruiting channels. The prominent Come Work With Us! tab redirects to an existing jobs portal. At the bottom of the page they reference a recent conference they attended as part of their design recruiting campaign, Did you catch us at IxDA and want to reach out? The link follows through to an email address set up specifically for messaging and recruiting around the IxDA conference, which is an Interaction Design conference that they were headlining sponsors of. While Amazon is only slightly late to the .design party, it’s really encouraging to see them holistically linking the new amazon.design site to their recruiting strategy as a whole. There is too much time and money spent on design recruiting to not take the extra step of a dedicated platform like this .design site. Copyright 2018 Top Level Design. All Rights Reserved.